California Highway Patrol Officer Jason Morton said the blaze is 0% contained and still burning along Interstate 5. I-5 is closed to through traffic northbound at Fawndale exit and southbound at Mott Road. 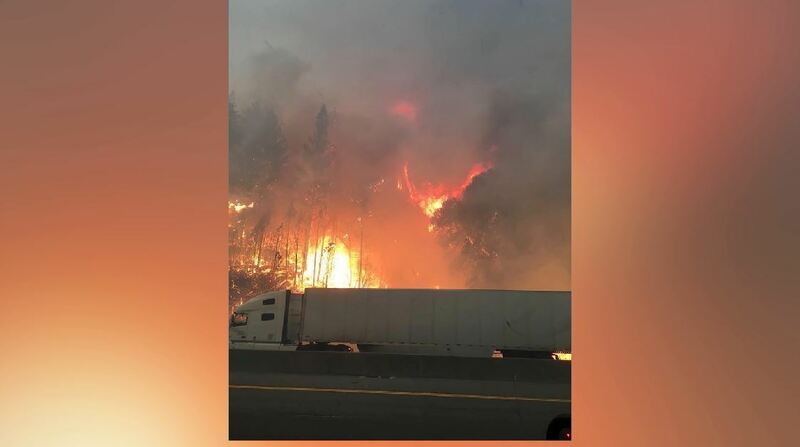 No injuries have been reported, but evacuations have been issued on both sides of I-5 north of Lakehead to the Shasta-Siskiyou county line. Authorities announced Friday that a 45-mile (72-kilometer) section of Interstate 5 north of Redding would remain closed at least until Sunday. Among the immediate challenges is the Delta Fire in northern California. The Delta fire is believed to have been human-caused, but details aren't available at this time. Crews managed to remove the burned hulks and abandoned rigs on Thursday but flames continued to burn along the edge of the road in some areas, fire spokesman Brandon Vacarro said. The two fires on Thursday were raging just weeks after a blaze in the Redding area killed eight people and burned some 1,100 homes in a frightening start to the fire season.